My tour in America had been somewhat curtailed by an affection of the eyes, the result of passing from a heated room - and they do stew you in their rooms in America - to a cold outside atmosphere. My Hanley friends gave me a most cordial welcome home again. My readers will not forget that during all this time I was the honorary head of the Imperial Mission, Hanley. My people paraded the town with a brass band, braying out jubilantly on account of my return, and in the evening welcomed me home. The Sunday scholars gave me a handsome Bible. While in America I had the pastorates of two fine churches offered to me. But I declined them, and when I got back among my dear people at Hanley I felt so glad I had declined. Before my American trip, I had conducted a few missions in connection with the great work of thc Rev. S.F. Collier in Manchester. I found when I returned home that Mr. Colliers committee had taken over the Free Trade Hall for a great Sunday night service. I was invited to work with Mr. Collier for a year. I accepted the call, and removed my home from Hanley to Manchester, where I have now lived for twelve years. At my first service in the Central Hall, I had an experience that was very trying to the temper and mettle. As I was describing what took place between Christ and the two thieves at Calvary, an old gentleman, whose hair and beard were almost as white as snow, and who was sitting close to the platform, uttered a loud cry of dissent. I stopped for a moment, then tried to proceed, but was again interrupted. The audience became excited, then impatient, then angry, and voices were heard crying, "Put him out! Put him out!" But this I would not have. "No, there is nobody going to be put out of this hall this afternoon. Leave our misguided brother to me. It is for such as he that this hall has been opened. When this meeting is over, I shall go and pray for him. Hundreds of you will do the same, and our erring brother will be brought into the way of truth." Then, to put the audience into a good temper, I told them a story of a certain converted prize-fighter. He was present at a meeting where a man would persist in interrupting the speaker, and, taking off his coat, he was asked what he was going to do. "Oh, I am going to ask the Lord to let me off for five minutes until I settle with that fellow who is spoiling our meeting." I told the people, that I myself had for a moment felt a little like that prize-fighter that afternoon. Then I offered up a prayer on the old man's behalf. That prayer called forth many "Amens" the loudest of which came from the old man himself. When the service was over, the white-haired old gentleman made his way to the platform, and shook hands with me in the most friendly manner. During this year I conducted services occasionally at the Free Trade Hall and the Central Hall, besides holding special meetings in the various chapels of the mission. I was also sent on visits to Lancashire and Yorkshire towns on behalf of the mission. My year of service was so successful and so helpful, both spiritually and financially, to the mission, that the committee unanimously invited me to stay a second year. And I did. I consider that my connection with the Manchester mission opened my way among the Churches in England more effectually than any work I had yet undertaken. I was cordially received in many Methodist centres into which otherwise I should not have penetrated for years to come. But as a fellow-worker, though in a humble way, with Mr. Collier, I was received with open arms in every Methodist chapel I visited. One of my richest possessions to this day is the friendship of Mr. Collier. He is my pastor, and I do not think any two men in the kingdom have ever taken so many meetings together as we have during the last twelve years. Mr. Collier preaches in the Free Trade Hall to the largest Methodist congregation in the world. A very able, practical preacher he is too - a preacher who makes every man feel that he is his friend. As an organiser he is, as far as I know, unequalled, and is, to my mind, the wisest statesman in the religious life of this country. His mission is now the greatest thing of its kind in the world. I have known, in some degree at least, the forward movements in America, Australia, and Great Britain, but not one of them can compare with the Manchester Mission. Mr. Collier's first congregation consisted of forty-two people. Now 14,000 persons are gathered every Sunday in the various chapels of the Mission. The membership at the beginning was forty-five; it is now between 5,000 and 6,000. The income necessary for the work is £10,000 a year, and three-quarters of this is raised by the Mission itself. If the income was trebled or quadrupled, Mr. Collier would easily find beneficent and profitable use for it. The membership of the Manchester Mission includes many persons who have had strange careers. There are some converted burglars in the congregation, and I know of at least one converted murderer, a man who was saved from the hangman's rope solely on account of his youth. During ten days' special services that I conducted at the Central Hall we had forty meetings, four a day - a meeting for business men, an afternoon Bible-reading, conducted by the Rev. F.B. Meyer, B. A., Rev. G. Campbell Morgan, or other eminent minister, an eight o'clock service, and a midnight service conducted by Mr. Collier. This midnight congregation was the most wonderful assembly of people I ever saw. At ten o'clock 250 workers, accompanied by two brass bands, proceeded from the Central Hall to visit every beer-shop in that neighbourhood of Manchester, every music-hall, and every theatre. At the doors of these places bills were distributed announcing the midnight service, and as many persons as possible were given a personal invitation to attend. The congregation, numbering from 300 to 600 people, consisted of bookmakers, gamblers, drunkards, harlots and thieves. Many of them had been found walking the streets after the beer-shops and theatres were closed. Not a few were drunk, many half-drunk. I do not know of anybody except Mr. Collier who could have managed such a congregation. His method was to give them a lantern lecture; to seize their attention by means of the pictures, and get in the Gospel when he could. It was pathetic to observe how a favorite hymn thrown on the screen - say, "When I survey the Wondrous Cross" -would move these hardened drunkards and lost men and women to tears. So overcome were some of them that they had to be carried out. The service was so impressive that it actually sobered not a few of them, at least to the extent of making them understand what was being said. During that mission 600 persons passed through the inquiry-room. Some of those who were won to God during my ministry at this time are now Methodist preachers. At a mission in Burnley one of the converts was a lad called George McNeal. George McNeal became the Rev. George McNeal, and curiously enough was until quite recently the third minister of the Manchester Mission, and as such my class-leader. It was Mr. McNeal's duty to take the overflow meeting from the Free Trade Hall, held across the street in the Grand Theatre of Varieties. One Sunday night, as he was going into the theatre, he saw a young man standing at the door smoking a cigarette. "Won't you come in; we are going to have a very bright service, and we shall be glad to have you with us?" He replied, "No, that is not for the likes of me. I will not come in to-night." Mr. McNeal urged him to think better of it and to come in, and then himself passed into the theatre. At the close of the service one of the workers came to Mr. McNeal and said, "There is a young man here who would like to speak to you." It was the same with whom he had spoken at the door. He was completely broken down. This was his story: "I came to Manchester yesterday. I have been a traveller for a firm in Huddersfield, and I have been tampering with my master's money. I knew that by yesterday I should be found out, and I had not the courage to face the exposure. So I bolted and came here, hoping to hide myself and my crime in this great city. But God has found me out. What shall I do?" Mr. McNeal said, "If you mean to be a Christian you must play the man. You must face your master, tell him you have done wrong, and throw yourself on his mercy." And the young man went away, arranging to meet Mr. McNeal next morning at the Central Hall. Monday morning came and the young man, fulfilling his appointment, told the preacher that he was fully determined to take his advice, and asked him to communicate at once with his employer. Mr. McNeal telegraphed. The employer did not answer, but took the next train to Manchester. He told Mr. McNeal that on Saturday, when he discovered the guilt of his employee, he went to the police station to obtain a warrant for his arrest, but he was too late that day. On Sunday he attended the church of Dr. Bruce, which, having been converted at a mission conducted by Gipsy Smith in the town, he had joined. The sermon was on "Forgiving my Brother," and the employer, cruelly wronged as he had been, felt that he could not issue the warrant. On Monday morning Mr. McNeal's telegram came, and he had proceeded at once to Manchester. Mr. McNeal told the manufacturer that he too was converted under Gipsy Smith, and this created a strong bond of sympathy between them. The master and employee had a private interview, in a room at the Central Hall, and as a result the young man was reinstated in his former position. He is living to wipe out the past and to forget it. "It was in the year 1883 that I first saw Gipsy Smith. Wandering down Anlaby Road, in Hull, I came across the Wilberforce Hall. Entering in, I was at once attracted by the remarkable voice and earnest manner of the speaker. A dark young man was delivering an impassioned appeal which stirred the audience to its very depths. On inquiry, I found it was Gipsy Smith of Hanley. I did not come into personal contact with the Gipsy until about three years later. Then began a friendship which has been continued with increasing warmth and strength to this day. We have been on closest terms of intimacy, and probably no two men have occupied the same platform together more frequently. I have the highest opinion of him as a man, a friend, and as an evangelist. In the early days of our friendship, Gipsy Smith several times conducted services in the Manchester Mission. I was so persuaded that he ought to be free to take special missions in the large centres, that I urged him to leave his settled pastorate at Hanley, and undertake evangelistic work in the wider sphere. Gipsy was naturally reluctant to leave the place where he had been seven years, and saw difficulty in leaving the work of which he had been the founder and mainstay. But at last he yielded, and I have always felt thankful that I had any share in leading Gipsy out into the great work God has enabled him to accomplish in Great Britain, America, and Australia. Gipsy joined the staff of the Manchester Mission as special evangelist in 1889. Applications soon came to hand for his services, and it was not long before it was evident that the Gipsy was in great demand. For two years Gipsy conducted special missions, with intervals, when he preached in the large halls of the Manchester Mission. No place was large enough to seat the crowd whenever his name was announced. "Many friends wonder why our special evangelist is so seldom with us during the winter months. This is not difficult to explain. There is such a great demand for Gipsy Smith as special missioner, and he is so richly blessed in this work, that the Manchester Mission Committee think well to grant many of these requests. So it comes to pass that our friend has been conducting missions at Hull, Barrow, Droylesden, Norwich, Lynn, Stockport and Oakengate, during the past four weeks. Showers of blessing have come upon the Churches connected with these places. The letters written by those in authority in the various centres tell of immense crowds, great spiritual power, and inquiry-rooms full of penitents. At several of the places men and women came forward unasked while the Evangelist was preaching. The speaker is gifted with marvellous power of pathetic appeal, mingled with terrible denunciation of sin of every kind. He displays a very clear insight into human nature, and deals consequently with deceit and hypocrisy. It is most refreshing to hear the law of God so faithfully expounded and enforced in its relation to the Atonement. The result is that the inquirers dealt with at the services are generally in deep penitence over a sense of sin. The chapel is filled every night." On Gipsy's return from America five years ago, it was my intention to make arrangements with him as evangelist on our staff. 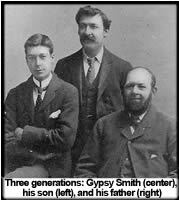 But the thought occurred to me that if the National Council of the Evangelical Free Churches would take up evangelistic work, and engage Gipsy Smith as the evangelist, the Free Church Movement would benefit, and with Gipsy as evangelist success would be assured. I spoke to two or three of the leaders of the movement, and as soon as Gipsy arrived in England made the suggestion to him, and begged him to consider the matter favourably. The result is well known, and throughout the nation thousands thank God that Gipsy was called to this work. I have watched with the greatest interest Gipsy's increasing popularity, and have rejoiced to see the growth of his power as a preacher and his success as an evangelist. Above all, one cannot but be struck with the abundant grace of God that has kept him true at heart and sound in judgment, amid such great popularity. God has bestowed on the Gipsy great gifts, and he uses them for the highest purpose. As a member of our Church, Gipsy is highly esteemed, and as a preacher, every visit is welcomed and greatly appreciated. In his own Church he is as popular as anywhere. Loyal to the Mission, he is ever ready to help it, and on many a platform has pleaded on its behalf."